Aches, pains, memory problems, trouble sleeping – sound familiar? At some time as we age, we’re all going to face these things. But, they don’t mean we can’t continue to stay active and live a full life for a long time. As a matter of fact, the more active you stay, the less you may experience aches, pains, memory problems, and trouble sleeping. You don’t have to run marathons. And, if you haven’t been all that active up until now, that doesn’t mean you can’t give exercise a try. You’ll be surprised how small changes can make you feel a lot better. No matter how fit you’ve stayed your whole life, you are going to age. And, that means you probably won’t be able to do everything you used to. If you are starting to suffer the pains of arthritis and other age-related aches, try some of these exercise routines. Swim: When you swim, you continue to get the aerobic and muscle-building benefits of running, hiking, or other activities. It is low impact, so you can say goodbye to those aching joints. And, you can go at your own speed. Walk: If you love the outdoors, there’s no reason you shouldn’t continue to enjoy it. You may not be climbing to great hights any more, but a walk through a park, or a trail with only slight elevation-gains is a great way to get some exercise. And, for a little added incentive, spending time outdoors helps elevate your mood. You can make an adventure out of your walks by taking photos, or identifying birds. Water Aerobics: Depending on what your doctor says, you may be able to leave your walker at the poolside. You’ll be more buoyant in the water, so your muscles won’t have to work so hard to hold you up, or to complete simple exercises. Even just walking laps in the pool is great exercise! Stretch in your Seat: There are great benefits to stretching. You don’t have to be able to reach your toes, you don’t even have to get out of your chair. Here are some great stretches for seniors at all fitness levels. Build Strength: As you age, it is important to stay as strong as you can. Strong muscles help protect your bones. And, anyone can build strength. Whether you are in a wheelchair, use a walker, or still have 100 percent of your mobility, you can probably do some of these great strength training exercises. Improve Balance: This is one of the most important things to do as you age. And, luckily, balance is something you can always improve on, even if you’re having trouble now. You can start by trying these simple exercises. We have a lot of activities for all fitness levels here at Pine Hills. You’ll love our golf course, and the fact that we’re within a few minutes of beautiful walking trails. 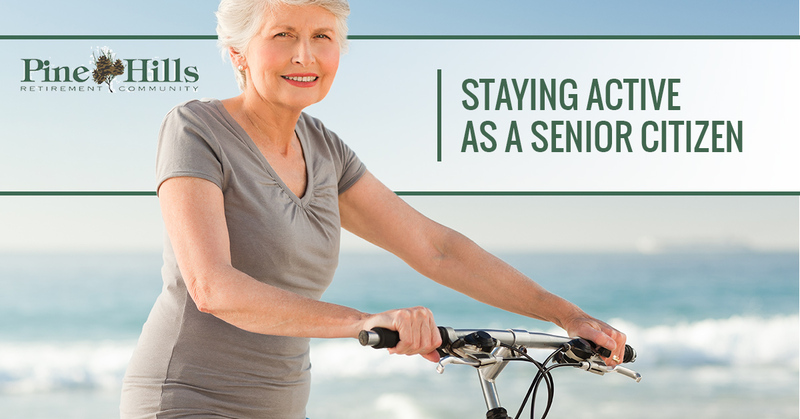 If you are looking for your retirement home, give us a call and come by for a tour! We look forward to meeting you.